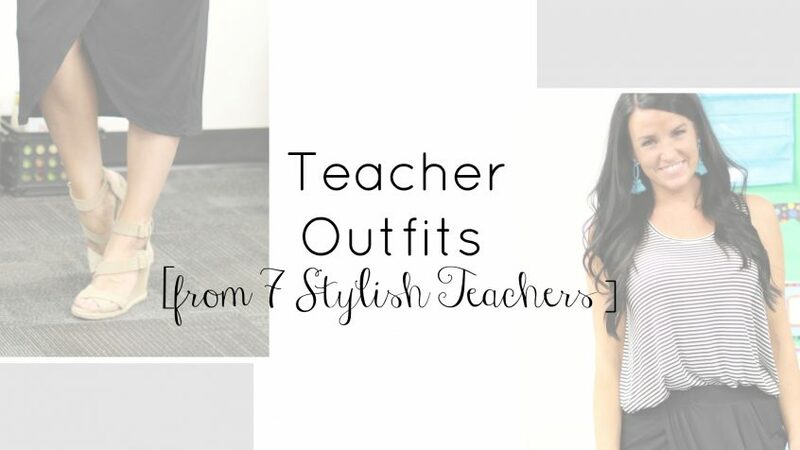 This week, I am collaborating with 6 other teachers to bring you “back to school” outfit ideas from all 7 of us! You will find links to their individual blog posts at the end of this post. My “back to school” outfit centers around one of my favorite summer purchases: a striped swing tank. Whenever I scour Pinterest for teacher outfits (SO fun to do! ), you wouldn’t believe how many are either based on stripes or chambray. I love BOTH of those things – but stripes won for this post! School started up a week ago, and I can’t believe how fast the 2018-19 school year has taken off! I hit the ground running, and sported this striped top to start! It’s very easy to take this tank into the fall (and even the winter) by adding cardigans, jackets, boots, and booties! Pair stripes with color, or keep it monochromatic. Take a look at the ideas below. Also consider pairing this simple striped tank with some other fall pieces I found on the carousel below . Click on any image below to shop! Jackets of all colors are so fun with stripes, too! And once tall boots come into season, you can definitely add those to your outfit rotation with this top and a pair of blue or black denim. Thanks for stopping by! I hope you enjoyed reading over a few other teacher blogs, too. Leave me a comment and let me know if you have a top or outfit item that is your go-to for wearing multiple ways. I think we are on the same page with stripes! I love all the ways you styled your top! I have a couple striped swing tank tops and you’ve inspired me to wear them in new ways this school year!! Stripes are just so much fun!! Loved your dress post – so inspiring also, especially with all of the pretty accessories!